First Line: "Maybe we'll find a gun," Pitkin said, aiming his finger at the guardhouse next to the gate. To the teenage boys living near the abandoned Soviet military base in northern Hungary, it is a potential source of hidden treasure, an opportunity to sell what they find and treat themselves and their families to things the rest of the world seems to take for granted. When Pitkin and Tamás find something in the basement of the hospital, they know it's better than drugs or guns to sell on the black market; these two impoverished Roma (Gypsy) boys have discovered an object that the right person will pay enough for to set their families up for life. But the item they've found and carried away from the old military base is much more than they ever bargained for. As one of the boys takes the object all the way to Copenhagen in order to sell it, he is unwittingly unleashing a whirlwind that has the power to affect the lives of every single person with whom it comes in contact-- among them Red Cross nurse Nina Borg. Although the object isn't specifically named until two-thirds of the way through the book, it doesn't matter; most readers are going to know what it is and be filled with dread as the action progresses, chapter by chapter. What ratchets up the suspense with each turn of the page is how this unnamed object affects the people along its path. Tamás's brother, Sándor, a law student in Budapest, has nothing to do with the object his younger brother has found, but his life gets blown to pieces anyway... as does the life of Nina Borg. Through the character of Nina Borg, a Red Cross nurse who also does work for a secret immigration organization, the authors have a lot to say about the living conditions of immigrants forced to live in camps in Denmark, and it doesn't strain credulity to think that the details are very similar from country to country around the world. It's much easier to sit in the comfort of your own home watching television to feel pity for refugees in their own countries; much harder when you encounter these same people face to face on the streets where you live. Kaaberbøl and Friis put a very real face on the rise of hate groups and the ongoing struggles of groups like the Roma. Nina herself does not see these people in terms of political agendas or right and wrong. She sees people who need help, and she gives it to them-- as much as she can, regardless of the cost to herself or her family. 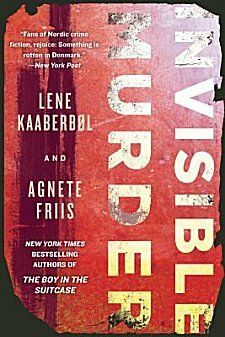 At first as I read Invisible Murder, I bemoaned the fact that there were several other characters taking the spotlight from Nina, a character that I grew to admire and care for in The Boy in the Suitcase. Then I fell under the spell of Sándor, the young half Roma law student who's trying so hard to rise above the poverty and the hatred that his people are forced to endure. I grew to like Søren as the inspector dealt with an understaffed police force faced with problems that mushroom daily. And what exactly does a cranky old man named Skou-Larsen have to do with what's going on? I grew a bit unhappy when Nina's character seemed subdued compared with her behavior in the first book, but I realized that the authors were being true to the danger presented in the book as well as to Nina's life. No one with a family can behave as Nina does-- giving her all for what she passionately believes in-- without consequences. Nina is faced with very real, very painful, consequences in this book, and once that unnamed object is dealt with, once all the other characters are sorted out, we're left to wonder just how Nina is going to react to the turn her life has taken. Now I can't wait for the next book in the series. Nina Borg is climbing higher and higher on my list of favorite crime fiction characters. I really need to read Boy in the Suitcase, because this is a series that I could really get into! It's also nice to read thrillers not set in the US, I find I really enjoy international suspense and horror novels! Cathy - I'll confess I just skimmed your review because I'm about to read this one myself. It's so good to hear you liked it though, and I am really eager to plunge into the story. I hope you enjoy it, Margot. But... you know me. I give very little away when I review a book! I don't usually notice cover art, but this cover is fascinating and apparently is related to the story. The series sounds terrific. Being an avid fan of Nina Borg's, I can't wait for my copy of this book to arrive in the mail. I lost myself in The Boy in the Suitcase until the last page was turned, and (im)patiently waited for the next book. I'm glad to read that it's as exciting as book one, even if some characters take away from Nina Borg's presence. And now you've got me wondering about the mysterious object, and the dangers it unleashes. Another book, which is beautifully written, about the Roma is Stef Penney's The Invisible Ones, set in 1980s England. And even Jo Nesbo's Nemesis deals with discrimination against the Roma. I actually learned quite a bit from these two books. I read with horror about mistreatment of immigrants going on now in Greece, as I also see discrimination and abuse here. After all, what does it take to be kind, compassionate and helpful to other people, many of whose lives are so much worse than our own. Thanks for the tip on The Invisible Ones, Kathy. I personally think it takes more energy to be hateful than to be kind. There are altogether too many people in this country who've forgotten one simple fact: all of our families came from somewhere else. Doesn't matter who we are, we are all immigrants. Although it's not a good thing to dwell on the past, there are a few things it's best never to forget. I agree about what you say about hatred taking a lot more energy than being kind. And I am the granddaughter of Russian/Polish/Jewish immigrants who fled czarist pogroms in the early 1900s, and the great-granddaughter of Irish immigrants who fled poverty. So, I feel the immigrant issue very strongly. However, as friends remind me, Native Americans were living here, and didn't emigrate; they didn't even have the right to vote, as my mother told me, when she did voter registration in the late 1930s. And millions of African people were brought here forcibly, not voluntarily, and don't consider themselves immigrants. And we know what they faced. At any rate, there is a lot of suffering in the world, economic and social, and people leave their homelands, many not wanting to do so, to try to find a better life, often times, just a job. Native Americans may have been here waiting for the rest of us, but they weren't always here either. They came thousands of years before when there was a land bridge between Russia and Alaska. I think immigrants have always faced suspicion and hostility wherever or whenever they arrive in a new country. With television and the internet, it's easier for us today to see what's going on, to know that it's wrong, and to do something about it. I still haven't read The Boy in the Suitcase yet but I'm glad to see the next on in the series holds up. You've made me want to move the first one up a little higher on the TBR stack.